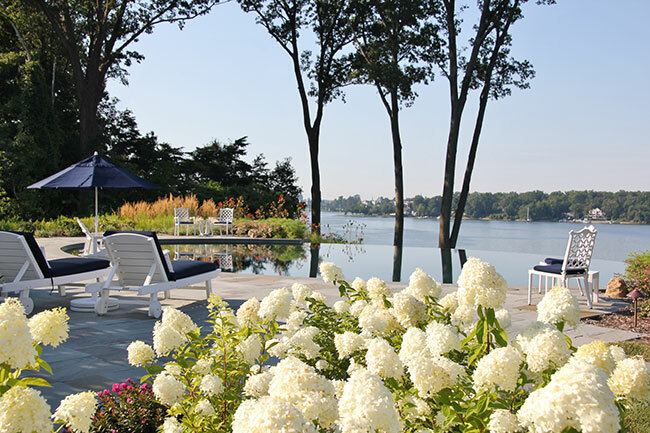 Company: Walnut Hill Landscape Co.
Photo credit: Walnut Hill Landscape Co. 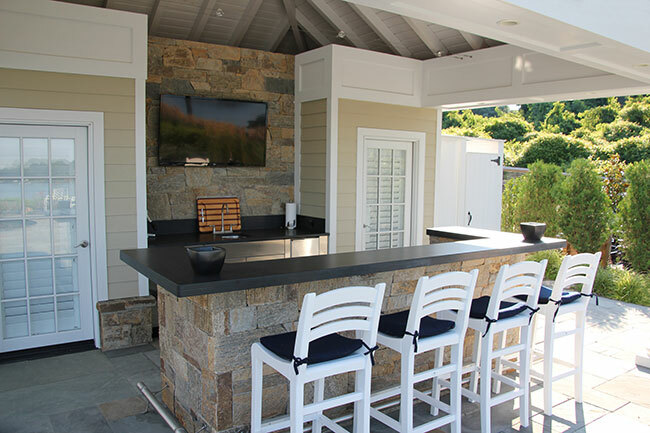 The Details: The clients wanted a “destination” outdoor living space—complete with pool, spa, grilling station, kitchen/bar, shade structure, cabana with bathroom and storage, fencing, outdoor shower, lighting, irrigation, and plantings to provide year-round interest. 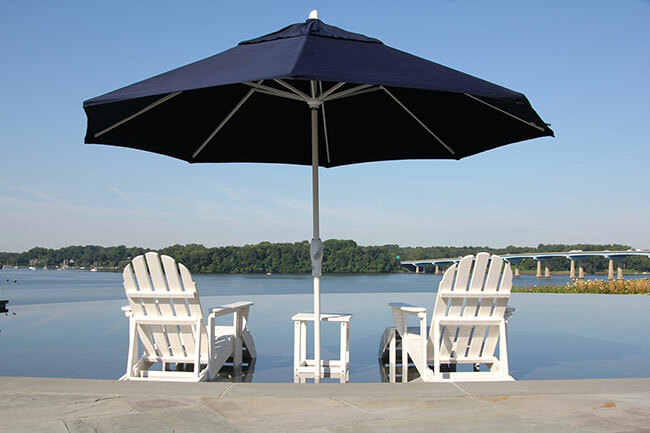 Because of the home’s close proximity to a river, county and state regulations were a concern. The original site was also open and exposed, lacking shade. 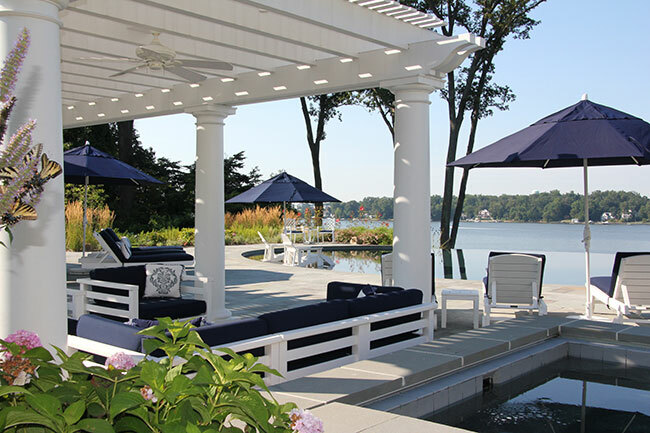 To comply with regulations, which required a minimum 100-foot setback from the water’s edge, the company built the entertainment area on the side of the home. 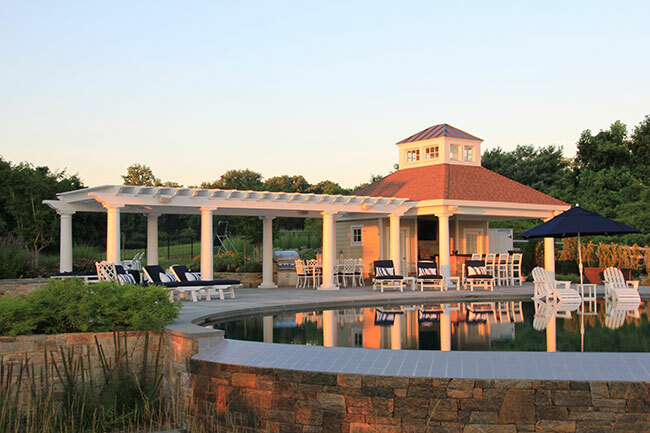 Centered on a large, oval, vanishing-edge pool, the bluestone patio offers a spacious entertaining area. Because the clients wanted the project to be completed by Memorial Day, Walnut Hill’s crews began in November and worked through harsh winter conditions, using heated tents to allow masons to work through inclement weather. 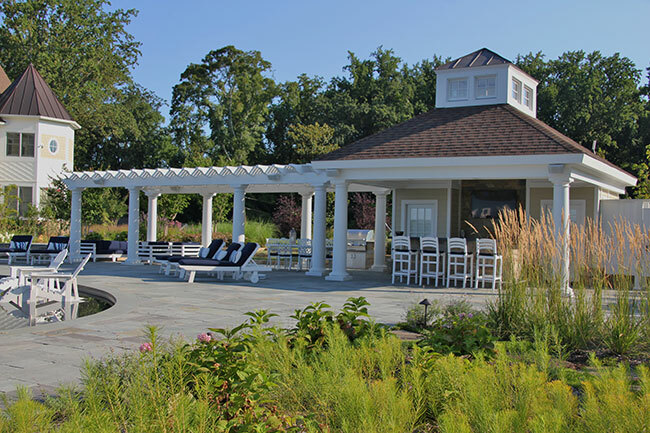 This project earned Walnut Hill a Grand Award last year from the National Association of Landscape Professionals’ Awards of Excellence program. 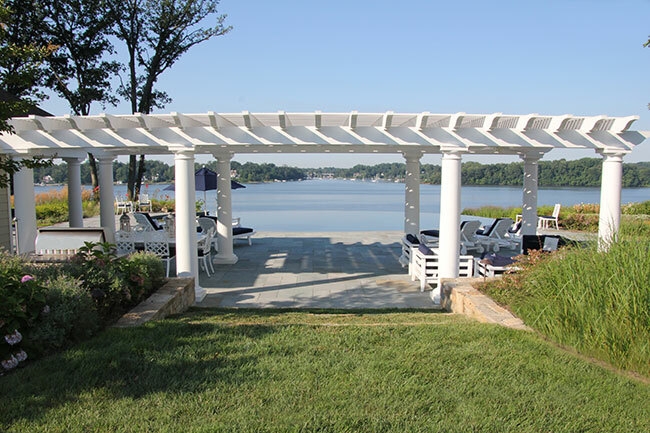 A large cedar pergola was built to define the entrance to the space, as well as provide shade for the seating and dining area. A “before” photo of the future outdoor living space, overlooking the river. 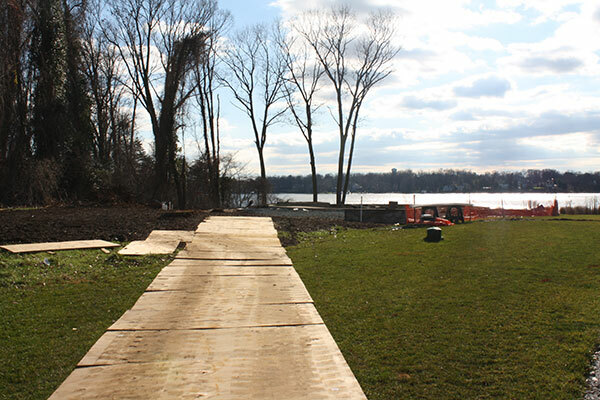 A temporary plywood road was constructed to provide access to the site without creating disturbance. 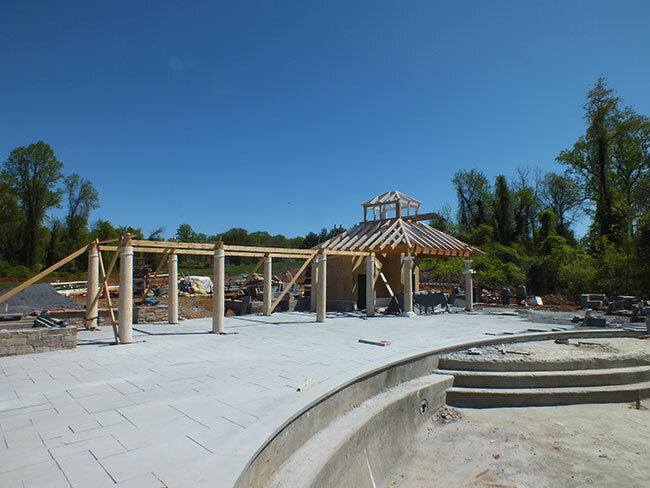 The bluestone for the patio and stone veneer for the walls were all laid with hand tight joints. 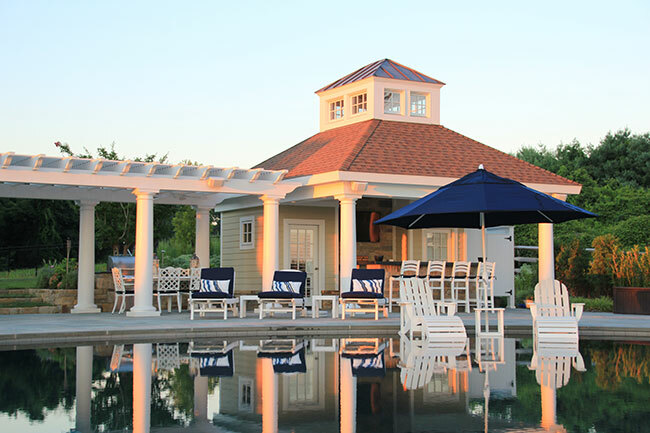 The cabana features a copper cupola, a bathroom, utility room with washer/dryer, outdoor kitchen/bar, and outdoor shower. Attention to detail, along with material selection and finish, was a priority to the clients. 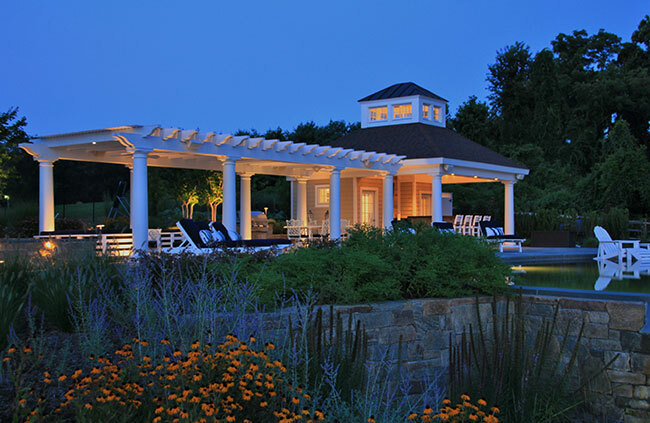 A spa was placed in the corner of the pergola, surrounded by stone walls to further define the space. The solar shelf offers a place to relax with a beverage, read a book or enjoy the view. Large masses of shrubs, perennials and grasses were carefully planted around the space to provide year round color and texture. 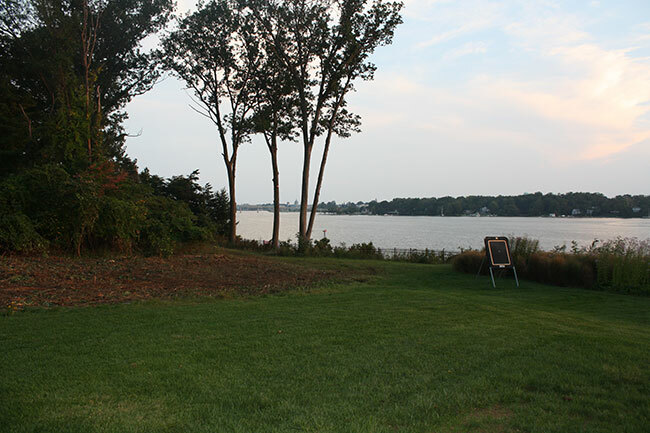 Trees were placed to create vertical interest without obstructing the views of the river. Russian sage helps soften the 4-ft. elevation change of the stone weir wall of the pool. The crew created felt paper templates for the bluestone pool coping, and sent them to the quarry for perfect laser cuts. 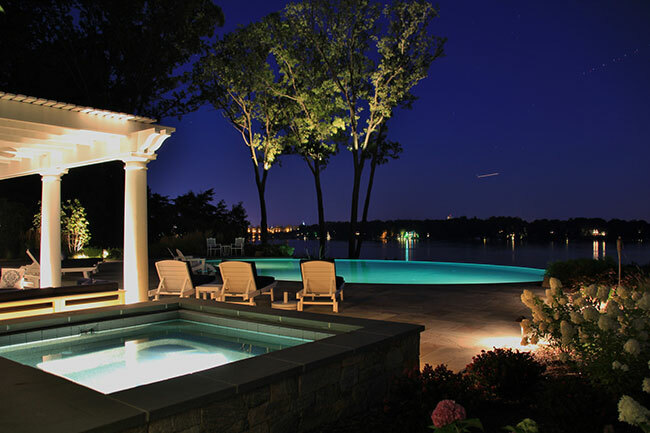 Lighting for the project was designed to highlight the space at night without obstructing the views. 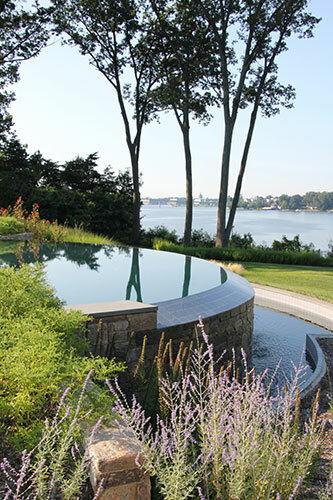 A vanishing-edge pool complements the river view.